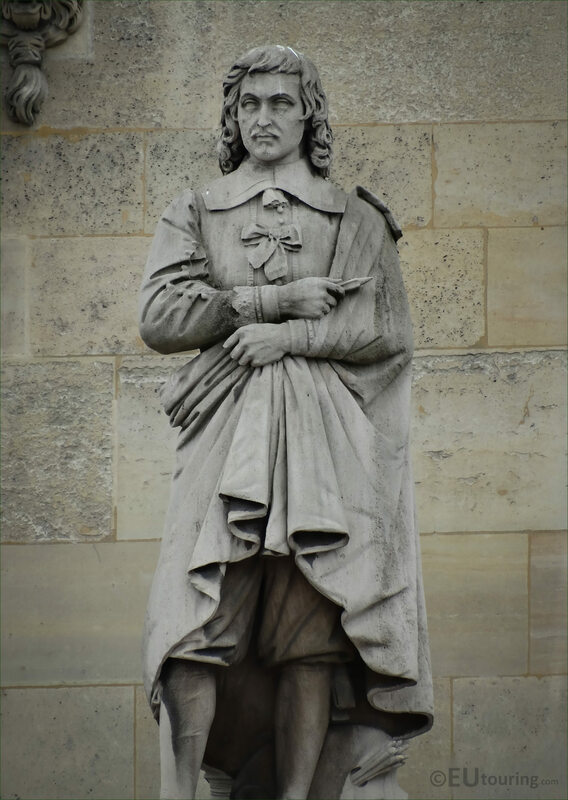 We took these high definition photos showing another statue on the Aile Mollien wing of the Musee du Louvre in the 1st Arrondissement, which is dedicated to Eustace Lesueur that was produced by Honore Husson. 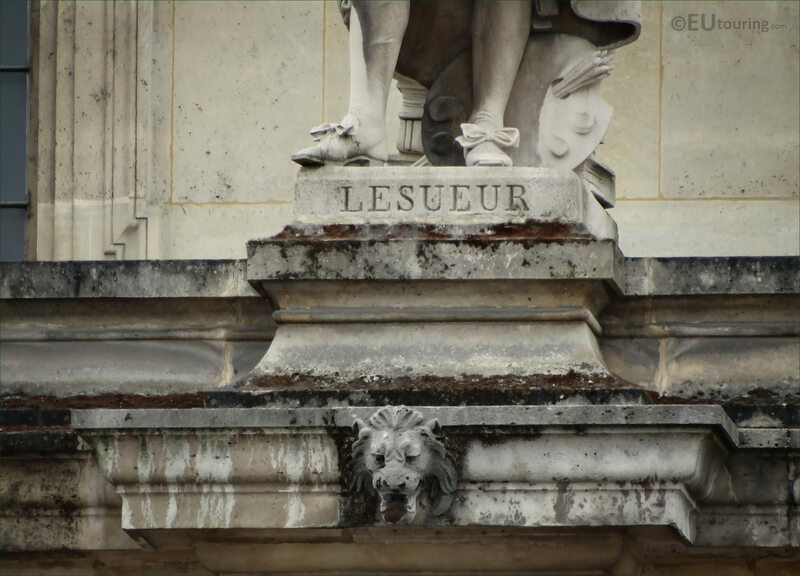 So when you are within the courtyard called the Cour Napoleon, and the look at the first level of the Aile Mollien facade, you will see the statue of Lesueur located in between the windows above the colonnade, fourth from the right hand side. Now this next HD photo shows a closer view of the Eustache Lesueur statue that was produced by the French sculptor Honore Jean Aristide Husson who was born in Paris in the July of 1803, and prior to passing away in 1864 he was commissioned for many public works including some of the sculptures on the fountains at the Place de la Concorde. 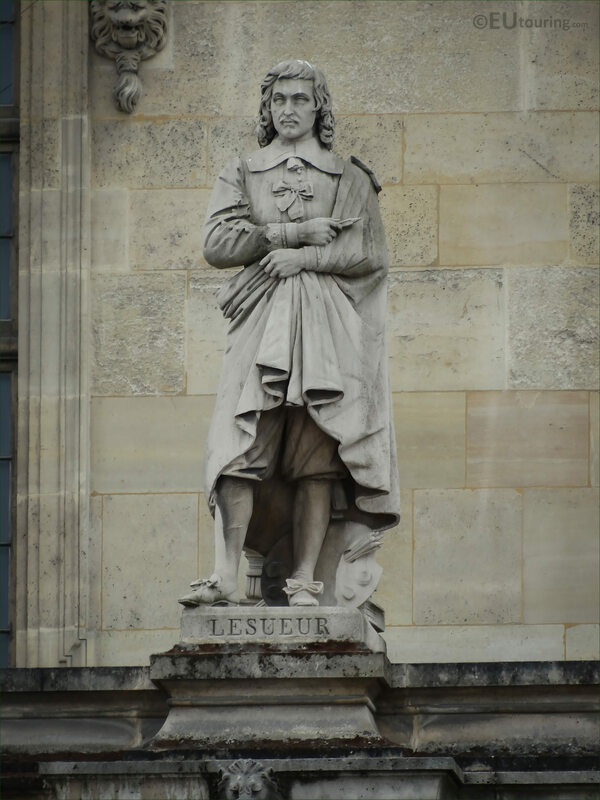 And in this last image showing the plaque at the base of the statue, with a painters palette resting at his feet, and this is dedicated to Eustache Lesueur, which is sometimes spelt Le Sueur, and born in Paris in 1617 he became a painter, and was one of the founders of the French Academy of Painting. yet there are many myths and tales that have been circulated over time due to him passing away at a young age in April 1655 and some say it was because he was broken hearted after his wife died.